For years I thought that real fudge brownies must be difficult to make. I guess something can be so good you think it MUST be difficult to make. You can see from the short list of ingredients and the easy instructions below that this brownie recipe is actually very easy. And I love easy recipes! Preheat the oven to 350ºF (325ºF if using a glass baking dish). Melt the chocolate and butter or margarine in a heavy saucepan over low heat. Remove from the heat and stir in the remaining ingredients in order, one at a time (the eggs also go in one at a time). Pour the mixture into a 9"x13" pan that has been lined with foil and greased. Bake for 20 to 25 minutes. 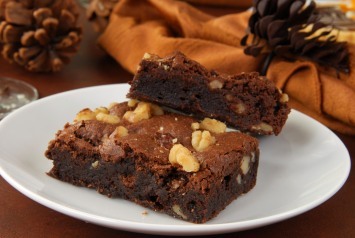 Do not over bake - the center should still have slightly moist crumbs when tested with a toothpick inserted into the center of the brownies. Cool thoroughly before cutting. (This recipe states that it they are actually even better if they are refrigerated overnight before cutting). I use butter in my recipes because I like the flavor and I actually think it is better for us, but you can easily replace the butter with margarine if you are a margarine user. 1/2 pound of butter might seem like a lot, but remember that the recipe makes several servings and it is a treat, not something we eat at every meal. So go ahead and indulge, just a little bit with this fantastic recipe. Here is the outcome, decadent, delicious brownies, ready to enjoy. These amazing brownies are just one of our easy dessert recipes. Find the rest here.